We’re obsessed with sriracha, the delicious red drizzle of spice & sweetness, and we like to add a little on top at every meal (hence why it’s on all Busaba tables for your custom heat-adding pleasure). Named after the coastal town of Sri Racha in eastern Thailand, we’ve dug up a few interesting facts & tales about one of the world’s most beloved hot sauces. Number 5: Apparently, one reason people feel like they can never get enough sriracha isn’t just because it tastes so good. Supposedly when you ingest pepper, capsaicin and dihydrocapsaicin, the elements in a chili pepper that make the pepper spicy, trick your system into thinking you’ve touched something incredibly hot. To cope, your brain releases endorphins, which give your body a natural high to ‘numb the pain’ it thinks you’ve experienced and makes you feel good! 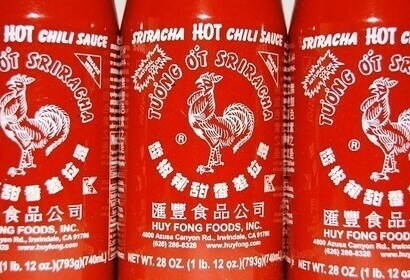 Number 1: The rooster on the bottle is actually the zodiac sign of the original sauce company founder! Find sriracha right on the Busaba dish menu, too, such as our popular vegan & vegetarian Sriracha Ho Fun Noodles.